Stop the press, Maid Marian way has had a new opening and it isn’t an Indian restaurant! What’s more the former karaoke pub, Chambers, is soon to open as a champagne bar. No, I don’t know what’s going on either. I’d thought Oaks had been open for a couple of weeks when I stopped by on a Tuesday night, as it transpired it was their second night following a period of soft launch. The name of the new restaurant is a reference to their cooking method with food cooked over wooden embers. I liked the dining space, a light, open-plan room with lots of wood as you would imagine. The drinks menu was jut the right size, though the only local nod I saw was Harvest Pale. The timing of our visit was particularly lucky as all customers in their first few days were treated to some extras. A bowl of crackling appeared and was one of the better examples I’ve had, very crispy and much lighter than most with a sprinkling of something spicy. At £2 I might like a bigger portion if I were to order them from the menu, but it was hard to tell if we’d been given a mini one as a freebie. The main menu is comprised, mainly, of sausages and burgers. A few other options; chicken, steak, halloumi and sea bass are available too. To get to try as much as possible we decided on a sharing platter. 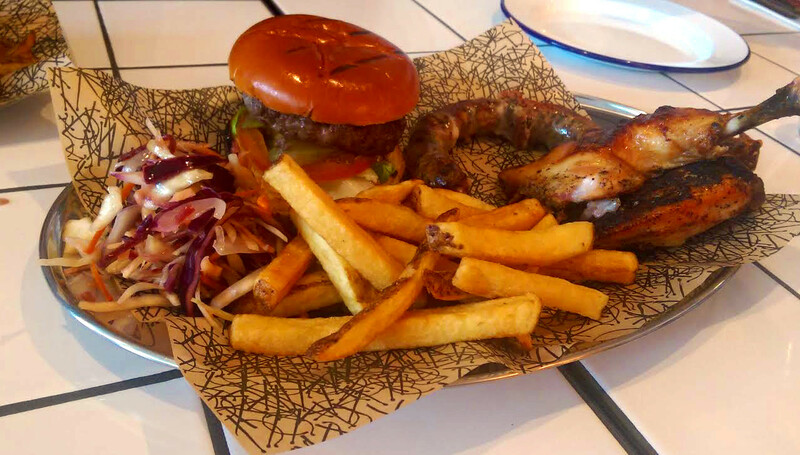 For £30 you get half a chicken, a sausage, a burger and 2 sides. The sausages are probably the most interesting things across the menu, our selection for the platter was wild boar broccoli and smoked mozzarella. It was really unlike anything I’ve had before. There were quite large chunks of the brassica in the sausages but mostly the strong boar flavour dominated. I enjoyed it, though I’d opt to have a different one if I were to come again. Lamb, rosemary and garlic particularly appeals now I look at the menu again. Chicken was the main let down of the evening, but then again it always is. It was cooked fine but the beer and black pepper marinade was not a strong enough flavour. Unless you give chicken some particularly punchy flavours its usually a disappointment in my experience. At the other end of the spectrum a burger was very good. It was genuinely cooked medium rare, which doesn’t often happen, and bone marrow added to the beef really seemed to boost the flavour. It was also a pretty traditional combination of pickle, tomato and lettuce which pleases me, I’m glad they didn’t feel the need to mess about and add unnecessary elements. Let the meat do the talking. Sides are relatively limited in choice. 5 options include 2 types of potato, corn on the cob, coleslaw and salad. We went for the chips, which I particularly enjoyed as they had a good crunch and the skin-on added a bit of something extra. The coleslaw was “naked” (which means they remove the best bit) it was still decent though with a bit of lemony dressing so it wasn’t too dry. 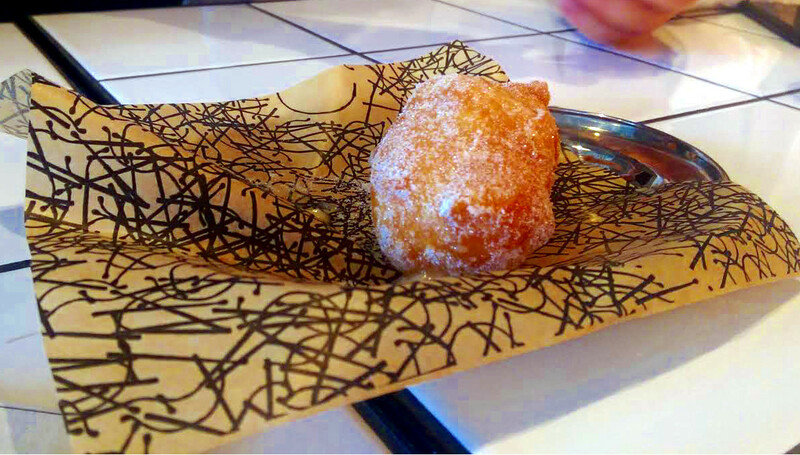 We were then asked if we fancied a dessert…as we declined the manager popped over and insisted we try the doughnuts. Who were we to argue? Very nice they were too, I hadn’t initially wanted to try them as a I thought they may be too heavy after a big meal but they were particularly light and fluffy with a filling of marsala cream. We were just discussing how well we had done with the free perks when the bill came and we discover that we also got 50% off the food! Clearly at that price the meal was a bargain, at full price the £30 platter was ok but if I were to return I’d go for a burger or sausage on their own. Or the bigger platter they have if there we more of us. Service from the manager was excellent, though his team were still in early days of getting to grips with things and they didn’t quite have the same charm. I enjoyed the experience, and their hospitality clearly will have had a positive affect. It was more chilled than other places you can get similar food, Reds, Rub and Five Guys are much more bustling and the style of Oaks suited me. I look forward to returning.